Last spring I rescued a male king pigeon who was wandering the streets of Philadelphia, and I am interested in adopting a rescue pigeon for companionship, preferably a female king. Southy, our rescue companion, is a healthy, sweet, and very well socialized pigeon, and our vet estimates he is about two years old. My wife and I are deeply invested in animal rights advocacy, so we are not interested in contributing to the overpopulation problem by adopting from breeders and the like. We would prefer to adopt a pigeon in our area versus having one shipped to us, because we are concerned about the stress that a shipped pigeon would endure. We are willing to travel a couple of hours (e.g., NYC) to find a companion. If you’re aware of anyone who may be a good fit for rescue adoption in the Philadelphia area, please let me know. I 'm going to sent a link to this thread to Jen. I think we can find Southy a companion very soon. Also, it would be wonderful to have the contact infromation for you vet or any others you know, that will treat Pigeons. We use LaToya Latney, DVM specializing in special species, at Penn Veterinary Medicine, 3900 Delanncey Street, Philadelphia, PA (appointments: 215 746-VETS). Dr. Latney is one of the best vets we've ever had, and she was very charmed by Southy. Penn Vet is expensive, as people in the area will know, but they also have an excellent worldwide reputation for animal medicine. Just wanted to pop in and say to you and your wife: lots. Wishing you the best in your quest to find Southy a companion. We use LaToya Latney, DVM specializing in special species, at Penn Veterinary Medicine, 3900 Delanncey Street, Philadelphia, PA (appointments: 215 746-VETS). * Dr. Latney is one of the best vets we've ever had, and she was very charmed by Southy. ** Penn Vet is expensive, as people in the area will know, but they also have an excellent worldwide reputation for animal medicine. * You are so very fortunate to have a wonderful vet at hand. ** Three cheers for Penn Vet. You could try contacting Wild Bird Fund in NYC. 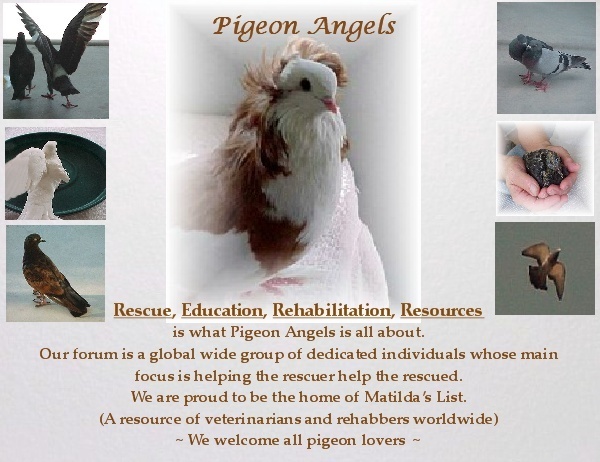 They do a lot of pigeon rescue and I'm sure know of people in NYC and surrounding areas who have birds needing homes. You can also try calling your local shelters in Penn. to see if they have any stray pigeons needing homes. There is one rescue group that has been involved with stopping those horrible pigeon shoots but I can't remember their name offhand. Thank you for the suggestions, Jen. Thanks for the suggestions, Jen, and for everyone's assistance. I'll keep an eye on postings at these rescue organizations. Ill keep looking too. I doubt it will be too long before a rescue turns up that needs a safe place. Another great place to check would be the Tri-State Bird Rescue in Delaware. They are not far from the PA line and occasionally have rescue pigeons in need of adoption!